If getting a well-rested glow naturally (the good ol’ eight-hours trick) isn’t cutting it, give one of these new facial treatments a try to fake a radiant complexion. What it is: On clean, dry skin, use a natural bristle brush in light strokes moving from your neck to your forehead. Benefits: Exfoliate dead skin cells and improve circulation. Our take: First, make sure to use a dry brush that is intended for your face—not your body. We tried the Aveda Tulasāra Radiant Facial Dry Brush ($44, aveda.com). Body brushes have thick bristles that would be too tough for the more sensitive skin on your face. I tried it in the morning, before cleansing since I tend to wake up looking puffy. I followed the included tutorial and made upward strokes starting at the bottom of my face and working up then continued with my normal morning routine (cleanse, antioxidant serum, moisturizer). The repetitive motion was almost meditative and kind of made me want to fall back asleep. I felt like it woke my skin up and that I could immediately see a little glow. After a few days of repeated use and consulting my dermatologist, I decided that using the brush every day was too much exfoliation for my sensitive skin type, but have continued to use it once or twice a week and love the results. 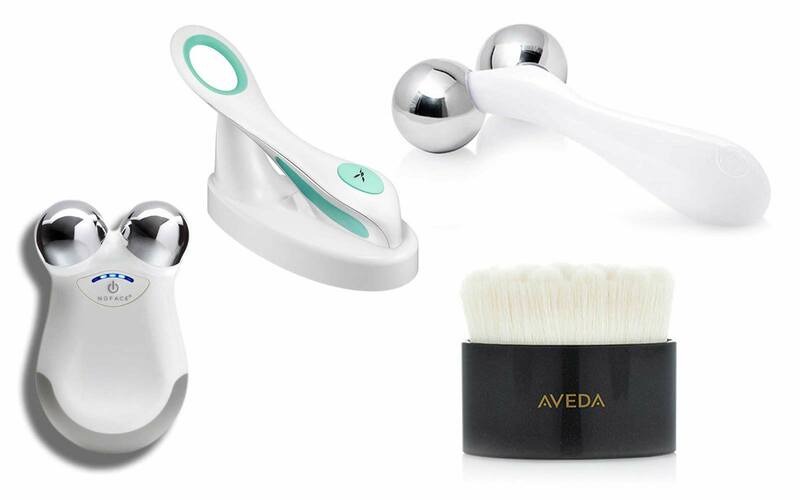 Benefits: Similar to dry brushing, a metal face massager rolls over skin to help promote lymphatic drainage and in turn, decrease puffiness, cool the skin, and some claim to help skincare products penetrate into the skin. Our take: I loved how relaxing it was to roll The Body Shop Twin Ball Massager ($9, thebodyshop-usa.com) over my lotion in the morning. It got the blood flowing and left my face feeling more awake. The key is to apply a serum or moisturizer before using the tool so it can easily glide across skin. I like to amp up the cooling benefits by keeping the massager in the refrigerator so the metal is extra cold. This treatment is great for sensitive skin or if you don’t want to disrupt your normal skincare routine since there’s no exfoliating or poking involved. What it is: A small, sterile blade is used to scrape off a very fine layer of dead skin and peach fuzz on the face. Benefits: Removing dead skin and baby hairs from your face can leave skin looking brighter and feeling smoother. It also clears the way so your skincare products can penetrate more easily. Note: Avoid dermaplaning on areas where you’re having an acne flare-up. Our take: Dermaplaning first started as an in-office treatment but we tried the new at home version with Dermaflash ($189, sephora.com). The tool comes with a cleanser and moisturizer to prep and soothe before and after the treatment, along with six blades (you use one blade per treatment). After cleansing, you attach one of the exfoliating stainless steel edges to the charged device and turn it on. Then hold skin taut and make upward strokes. The thought of putting a vibrating blade next to my face really scared me at first but once I made the first stroke and realized it didn’t hurt, it was fun to see all the white dust—aka dead skin—piling up. The first thing I noticed after I was done was how soft my skin was. With all of the hair gone, it was completely smooth. I did have a little redness at first but it quickly went away after applying the moisturizer. After one use, I didn’t feel like my skin was brighter but I love how clean it felt and how my much more even my makeup looked thanks to the hair being gone. Being a germaphobe, I also appreciate that you get to use a new blade every time so you don’t have to worry about not cleaning it right and bacteria building up. What it is: A facial treatment that uses a metal wand with different attachments to give off a low level of electric current to your skin. Benefits: By speeding up the body’s natural regenerative process, it can help firm, tone, and stimulate facial muscles. Our take: My first experience with microcurrent was during a facial at SB Skin in New York City, where models and beauty editors flock to get microcurrent treatments ($198 for 50 minutes, sbskin-nyc.com). After cleansing my skin, the esthetician glided two metal prongs in upward motions over my skin, lifting my skin up and out toward my hairline. It felt like little zaps (painless, just weird) and left me with a metal taste in my mouth. I walked out of the spa a little red (the woman told me it was because of boosted circulation), but noticed that my face looked lifted and even more contoured—hello, cheekbones. Though the results were temporary, it could be worth the splurge before a big event (say, a wedding, which is what I did it for). At-home microcurrent devices are available, including the NuFace Mini ($199, mynuface.com), which requires five minutes of use per day in order to see results. Yes, it’s an investment, but the convenience of being able to use it at home before a big night is nice.